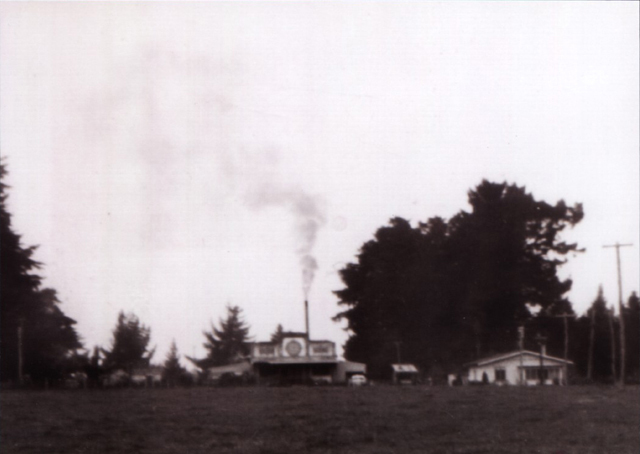 The above photo was taken in 1935, soon after the main dairy factory was completed by Frederick and Samuel Lye and their families. Note the several Lye staff members, and the 'Vacro Milk' branding on the delivery trucks. The factory traded through WWII and was bought by the NZ Co-operative Dairy Co in 1947. Above: The factory some years later with the coal-fired boiler running, seen from Scott's Farm opposite. Above: Internal factory hardware. These ceramic tiles are still present on the walls and floor in our building. 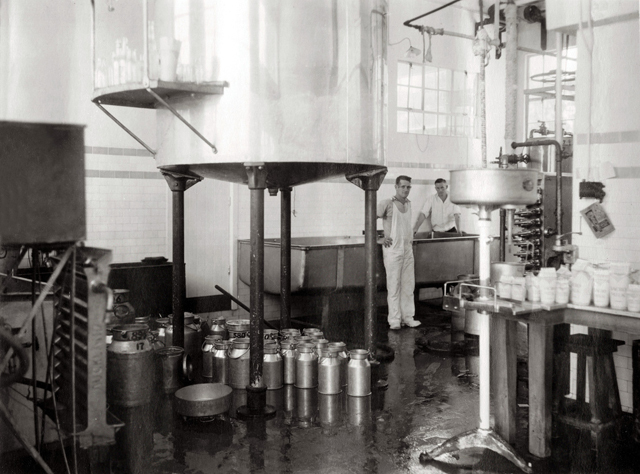 Above: Staff at work in the factory, note the cartoned milk on the right table. 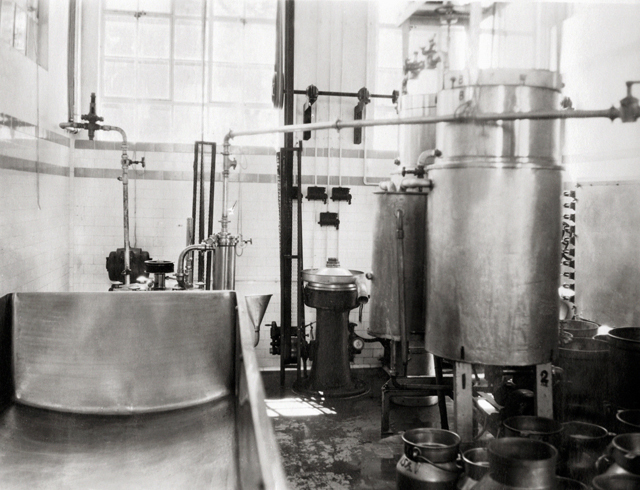 Above: milk was weighed here on the front platform behind the canopy, before being poured down a chute into the factory vats. The light fitting at top is still dangling from the factory roof. 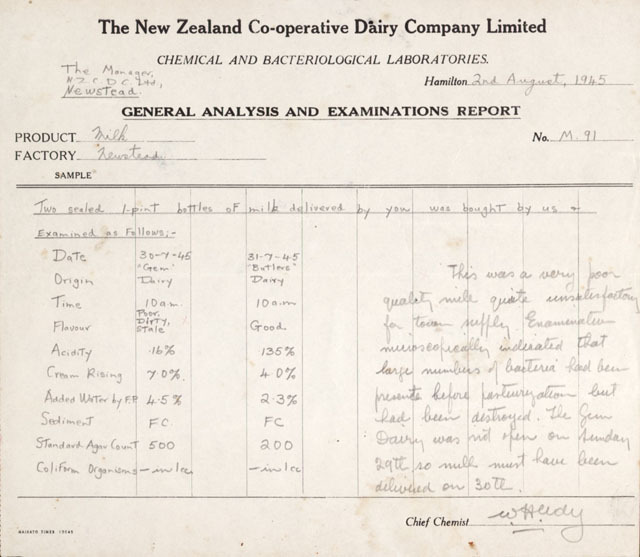 Above: A milk quality report from The New Zealand Co-operative Dairy Company. As you can see from these photos, the Novel Ways premises were built in 1935, just after the Great Depression, and local farmers supplied whole milk in large cans. This was pastuerised using a coal-fired boiler and cartoned in imported waxed cardboard containers, until these were no longer available and glass bottles were used. The milk was delivered all around Hamilton in the trucks seen above. Factory co-founder Frederick Lye was a member of the Liberal Party (later renamed the United Party) and was the MP for Waikato from 1922-1925. He served another two terms (possibly with the Reform Party) from 1928-1935. 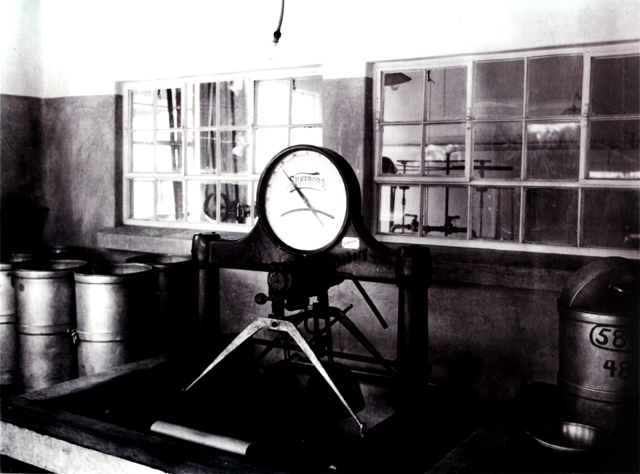 Frederick Lye (resident of Pukekura, near Cambridge) was presented with a gold watch by the constituents of Morrinsville for setting up a milk factory there too. Samuel and Marion Lye (Eureka) died in 1937, but the factory was carried on by the family until 1947, when NZCDC bought the site. Part of the Lye family farm on Vaile Road is run by DairyNZ as a research site. Several of the Lye family live nearby, and kindly provided these photographs for scanning. In later years the premises were used for storage, and for 36 years from 1962 the late Mr Reg Petrie owned the site and used it as an engineering workshop. Novel Ways bought the site the main factory sits on, from Mr Petrie in 1996. We are steadily renovating parts of the building, and try not to remove any historical aspects. We'd like to restore the "Hamilton Pure Milk Supply" canopy at some stage.